What is it about being a parent that ramps up the guilt dial? Whether you go out to work or stay at home, feed from breast or bottle, let them cry or sleep in your bed, there is always something that makes you question whether you are doing this parent lark right. Recently, I’ve been feeling particularly guilty over the fact that my girls don’t have any regular access to swimming. When they were tiny and we were waiting on Emily’s heart op, we weren’t allowed to take them for fear of infections. By the time it was OK, many of my friends had been attending baby swim classes for months. In baby magazines, I see adverts for fab looking swim sessions and underwater photo shoots. The problem is, they require a 1:1 ratio with child to adult. With twins and a husband that works weekends we just can’t go. The idea of taking them alone to a pool just terrifies me. In fact the changing process scares me more. Two wriggly toddlers in a cramped cubical dripping wet and cold doesn’t sound too appealing on my own so I just haven’t done it. Daddy2twindividuals grew up in a Jersey and learnt to swim in the sea. By the time he started school, he was a confident swimmer. We’ve taken Jess and Emily to the pool many times but it’s nothing compared to the weekly sessions lots of toddlers are getting. I absolutely love swimming and believe it is such an important life skill which we need to teach as early as possible. Luckily, when we have been around the water, they’ve loved it and seem pretty confident. Hopefully they’ll catch up when they are of an age to attend classes without an adult. Until then, I may have to be brave and start taking them to public sessions on my own. What tips do you have for taking toddlers swimming alone? I need some parenting hacks and words of encouragement. It doesn’t bear thinking about, does it?!?! I have this guilt! As an adult, I can’t swim well and I wish I had the time, confidence (and money) to take mine, and to get them lessons! No tips here-but just wanted to drop by and let you know you’re not alone!!! I’ve got nothing apart from sending you positive thoughts and wishing you luck! I feel the same guilt. Bens only been swimming a handful of times. Doing the changing thing singlehanded is so hard so we’ve only gone as a family which is hard when we both work full time. He does love the water though! I have managed to take my 2 and a half year old toddler twins swimming twice by myself. It’s actually not that bad now they aren’t babies anymore. I shower them both quickly, get them in a poncho towel and give them a snack. This keeps them quiet while I quickly get ready, then I dress them one at a time. I have been lucky enough to get a large family room each time I go. Some pools have poolside disabled/family changing rooms which is handy if you aren’t bothered about showering after. 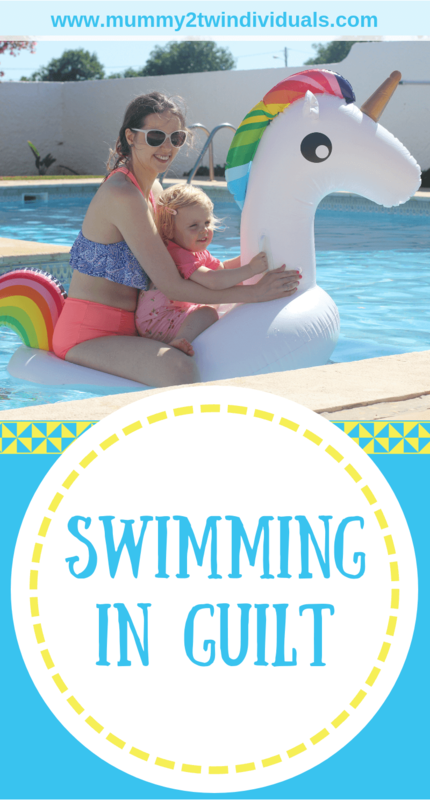 I did take my daughter to swimming lessons and twice it ended in disaster. So don’t feel bad. I think they do better when they’re older anyway! !